Simon Bland is a painter of portraits, contemporary landscapes and still life. Born and raised in Yorkshire, a county in northern England, Simon has been drawing and painting from childhood. After graduating from Cambridge University he pursued careers in other fields before finally turning his passion for art into a career as a working artist. 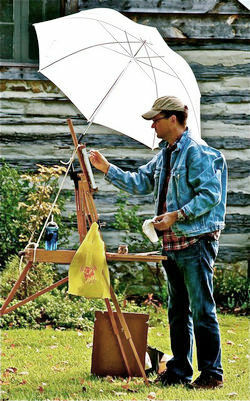 His landscapes are either painted en plein air or in his studio from sketches and photographs taken on location. His work reflects the personal journey that has taken him from his beginnings in England to the Pacific Northwest. Since 2003 he has painted full-time, completing over a thousand original works and many more sketches and studies. In 2015 Simon and his wife, Kate, moved to Seattle from Washington, DC. As a newcomer to the Pacific Northwest he has been hard at work completing commissioned works, making new friends, and exploring things and places to paint in and around the city. Simon painting at Welsh Farm in Hamilton, VA. Photo credit Donna Clark.